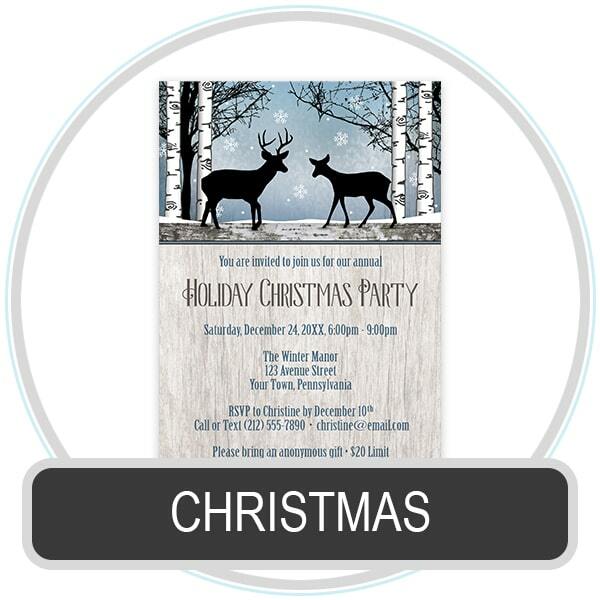 Custom Holiday and Christmas Invitations. Modern and rustic Christmas invitations for the Holiday Season. These invitations are custom printed with your celebration details on the quality invitation card stock of your choice. Whether you're celebrating with family and friends, or organizing a corporate or office party, these Holiday and Christmas invitations are personalized with your event details. Included in your purchase is a complimentary proofing process with the Designer. This allows for us to get everything right for you, emailing you a proof image post-purchase for your review and approval before your holiday invites are printed. Having a large event or party? The more you order, the more you save with discounting your invitations when bought in bulk quantities starting at 50 invites.